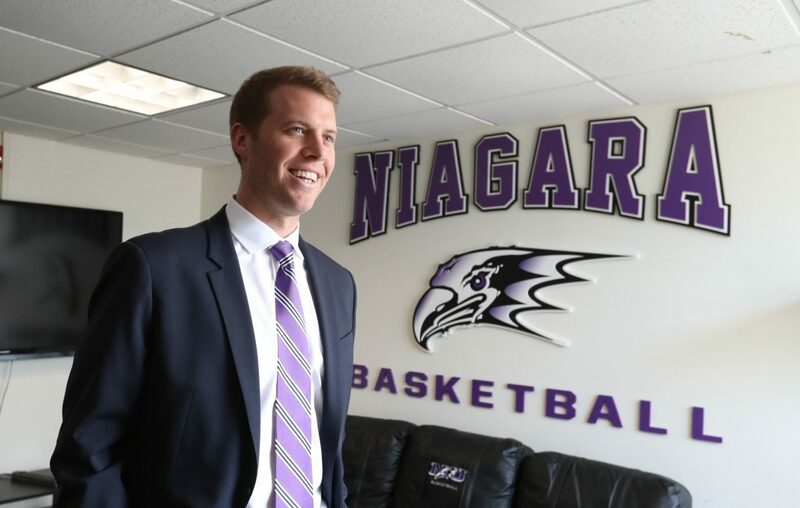 LEWISTON – Patrick Beilein brought a sense of optimism to a program that sorely needs it Tuesday in his introduction as the men’s basketball coach at Niagara University. 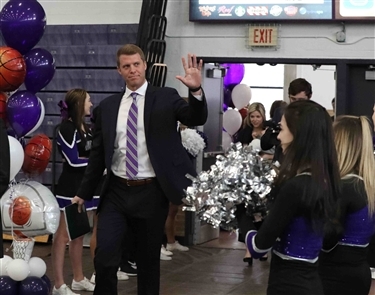 That was music to the ears of the crowd of about 350 gathered at the Gallagher Center to welcome the 36-year-old coach. Niagara compiled a record of just 64-129, a .332 win percentage, in the past six years under recently fired coach Chris Casey. The Purple Eagles are coming off a 13-19 season in which they finished 10th out of 11 in the Metro Atlantic Athletic Conference. Beilein, the son of Newfane native and University of Michigan coach John Beilein, compiled a 77-44 record at Division II LeMoyne over the past four seasons. He led LeMoyne to the NCAA Division II Tournament in each of the past three seasons, including an Elite Eight appearance in 2017-18. Niagara graduates three senior starters and its top two scorers and rebounders. Beilein said he does not view the job as a colossal rebuilding project. “I don’t view it that way at all,” Beilein said. “Watching film of the team last year and the returning pieces that I know of, there are some parts here. Sometimes it just needs a different – we talk about culture – this would be on the court. ... It’s gotta start off the court with the little things. The attention to detail. John Beilein has won 754 games in his career as a college coach, including 89 at Canisius in the 1990s. He was in the front row at the news conference to watch his son’s big day. “I think it was a no-brainer for him and for the university,” John Beilein said. Patrick Beilein was so optimistic he predicted a Sabres win tonight against the Nashville Predators. He and his family are going to the game. Check back at buffalonews.com for more on the hiring of Patrick Beilein.